It was September of 2011. We were a little demoralized. We had just realized that our plans to rapidly spread our new real estate form software for agents was foiled. We had rolled out in about 5 states but were seeing why expansion was a little tricky. Unfortunately the forms that we needed for each state are often owned and copyrighted. They are controlled by the Realtor Associations and licensed often at a hefty fee. In itself this wasn’t a problem. We were willing to pay the licensing fees to the various associations. Unfortunately these associations, years before, had all made a deal with the devil. Most associations had licensed the forms to the largest form solution provider in the country. When they signed these licensing agreements, there was a sneaky clause included. They had signed away their right to license the forms to anyone else. This big bad company had put an exclusivity clause in the contract. This prevented the associations from licensing them to any other company. We were reaching the same dead end in various states. We were successful only in the states where the forms were state promulgated. In these specific states like Colorado and Texas, the forms are regulated and required. This meant that they were public domain. We were able to offer our software with these forms in these states without a problem. Unfortunately we had just realized our master plan for this online business idea was foiled. We decided it was time to stop nursing our wounds and find our next product that we could build and sell to another captive audience. We wanted to use the same base engine of our software but try and apply it to another type of form. The work required would be substantially less if we re-used the same software. We could find a similar online business idea and change it for that. In a quest to find the next product, I started searching with Googles Keyword Tool. This was before I got educated about the beauty of LongTail Pro. For those of you who aren’t familiar with Googles Keyword tool, its amazing. 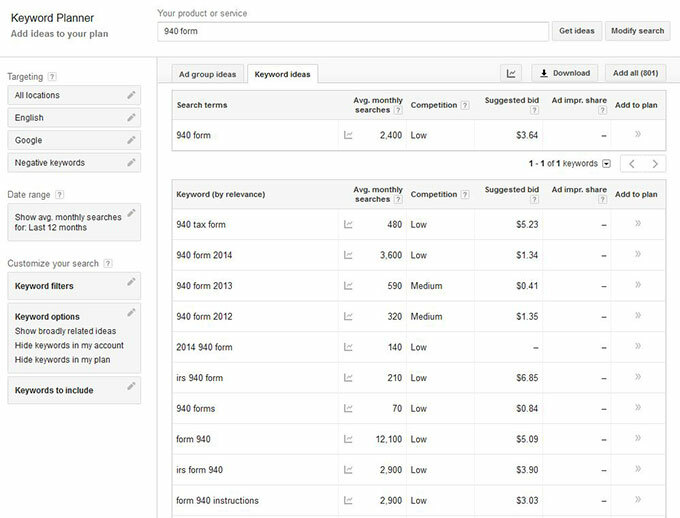 As part of Googles AdWords platform, they provide a Keyword research tool. This tool lets you type in any word to show you related searches from Googles site. It also shows the number of searches for each keyword on Google monthly. Furhtermore it will show you the competition for this word on AdWords. Its an incredibly powerful tool that is free. We used to use it for various things including picking a good keyword for your blog post. We now use LongTail Pro. You should take a look and Spencer Haws the owner there has given our readers a free trial if you click through this link. If you decide to buy we get a little something also which is greatly appreciated. At the time I was searching for the word “Form.” I wanted to see what other forms people were looking for. I wanted a term that had a large amount of monthly searches and was a good match for our software. After trolling through various results I came across the search term “940 Form.” I had no idea what this form was (1st mistake). People seemed to be searching for it in large numbers though. If you sum up the variations of the search terms, there appeared to be close to 20k searches a month. There must be some kind of online business idea here. Almost 20k related searches a month for this online business idea. What could go wrong? After Googling it myself, I figured out its actually a tax form. Employers use this form annually (2nd mistake) to report and pay the unemployment owed. The form is rather straight forward and its a public domain IRS form. There was low competition on AdWords (missed warning sign) and I thought we may have a winner. So I went over to GoDaddy to look for a direct match domain name. Can you believe our luck? . The exact keyword phrase was available. [ 940form.com ]. (Another missed warning sign) We registered the domain and off we went. As I started to do some more research, I took a look at the IRS e-file system. It turned out we could spend a little more time and make our online business idea that much better. We could build the ability to directly submit to the IRS. We could build the XML submission and allow users to directly file their 940 Forms online to the IRS. (3rd mistake) One of our prior form solutions already had similar XML submission functionality. 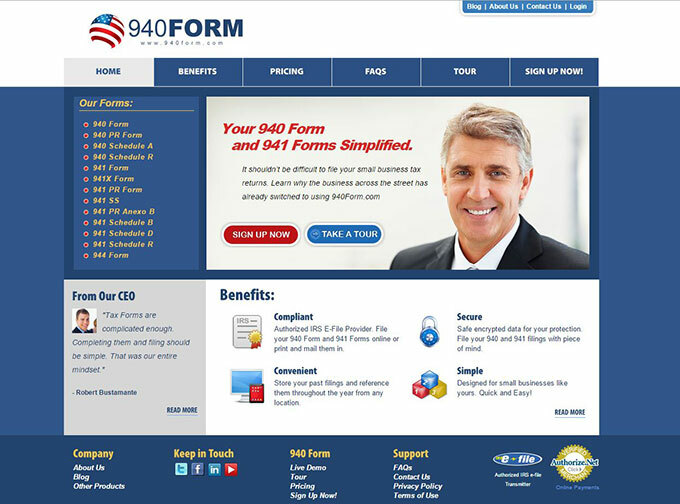 We could revise the functionality for 940 Form and be able to submit to the IRS. Que Lindo? The failed online business idea nobody cared about. Over the course of the next 2 months we built a beautiful application. We built an attractive sales site. We went through weeks of IRS applications and testing cycles to make sure the software was working. We had built an attractive, functioning application. We were proud of this one. We learnt from our mistakes on past projects and refined how this one worked. This online business idea was full proof. What could go wrong? We realized that we were going to have a difficult time reaching people. It was going to be tough to sell our solution. We had a problem but we had a plan B. We knew how to optimize our site and we had the exact keyword match domain name for 940 Form. Within 60 days we could blog and get enough organic traffic that we would start getting traffic. 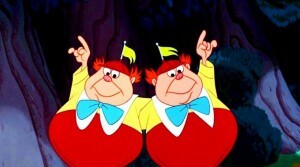 These would be the people who were looking for us. We pushed ahead and spent a lot of time working on the SEO of the site. We built individual content rich pages for each form type. We wrote tax blogs and various pages of content specific, keyword rich, posts. It worked. After 30 – 45 days we were ranking on the first page of Google. At one point we reached the second spot underneath the IRS themselves. We were getting visitors but a strange thing was happening. Nobody was signing up. It was absolute silence. At one point we were getting 100 unique focused users to the site. Nobody was signing up. It was a bust. We knew. We didn’t want to admit it, but we had just wasted $10k and 2 months time. 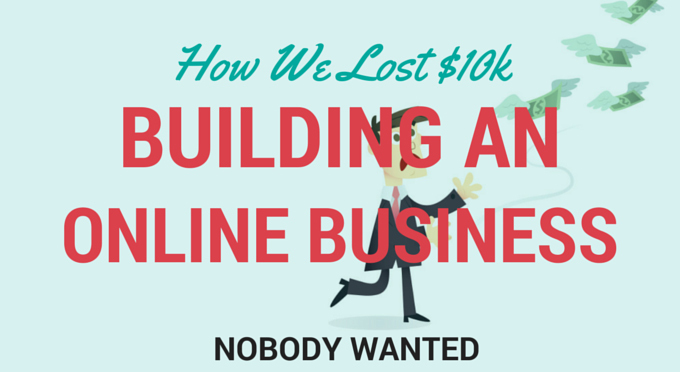 We had built an online business idea that nobody wanted. It was devastating. We had made so many mistakes and missed so many signals. We were blinded by the success of our prior products that we became complacent. We built and incredible piece of software that nobody cared about. The site is still up today with some odd free users generating forms but its a grave yard. 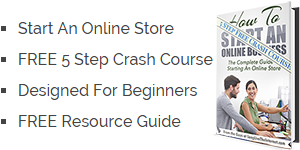 We have talked about pulling out the site and putting an affiliate link to Quicken or Quickbooks. We haven’t had the heart or the time to do it. In summary we made a lot of mistakes and missed a lot of warning signs. Below is a summary of our online business idea failure. We can only hope you won’t make these same mistakes. If you don’t know anything about the problem you are trying to solve how can you possibly improve the process. We followed a hunch but never spoke to 1 person who would use this. We had no validation that a problem or need even existed. Our online business idea provided a solution to a problem that didn’t exist. If your solution is needed once a year, its going to be a tough rest of the year. We love the idea of recurring revenue. We had built the software as a subscription based solution that was only needed once a year. If you file once a year or maybe each quarter, why would people be willing to pay us a monthly fee. We iterated on this after it was up, but it was too little, too late. Build a [ minimum viable product ] and worry about all the bells and whistles once you have traction. We spent so much extra time getting IRS approved. We built the mac daddy submission functionality to the IRS. We should have launched without this. We would have seen there was no interest. We could have saved thousands of dollars and a month of our life. Build a minimum viable product and add features once people ask for them. Maybe we can have T-Shirts made with this and at least enjoy them while laying on the couch. We chalked it up as a bad loss and moved on. We got burned and it was our fault. We couldn’t blame anyone but ourselves. We officially built an online business idea nobody cared about. Don’t let this happen to you and learn from our mistakes.